Dallas TX Chinese artist Dr. 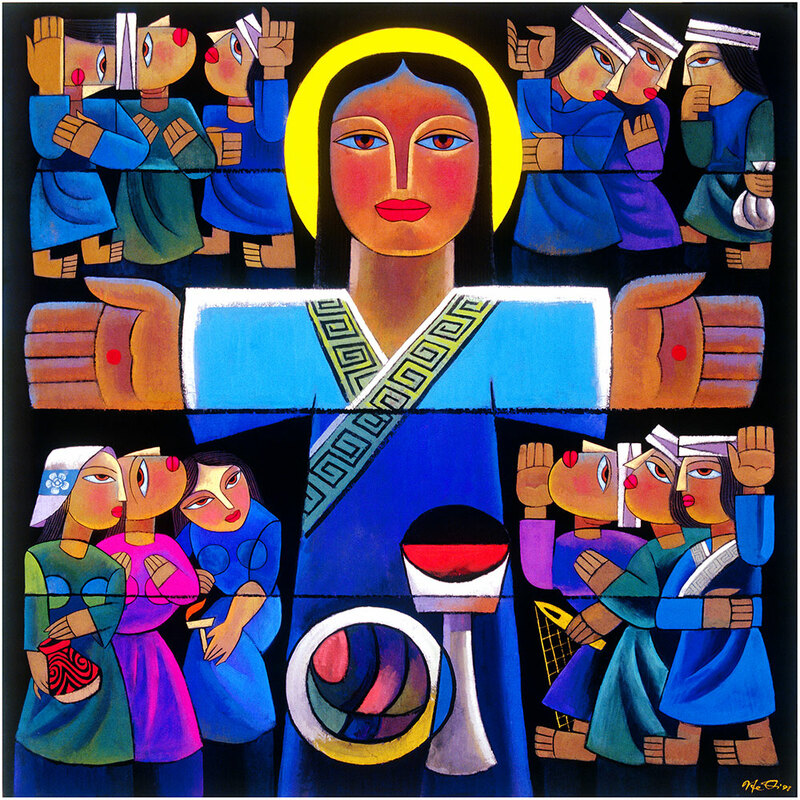 He Qi has rendered custom versions of sought after giclée original liturgical art for use in celebrating a series of major feast days observed in the life of Saint Michael and All Angels Episcopal Church. Author and international speaker Dr. Richard Melheim describes the artistic style as, "...Chagall meets Matisse meets Picasso meets the East. Vibrant. Energetic. Breathtaking. Biblical. Humorous. Whole-world art." 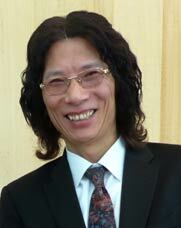 He was the first among Mainland Chinese to earn a Ph.D. in Religious art after the Revolution (1992). He also received his Honorary Doctor Degree from Australia Catholic University in Melbourne (May, 2011). 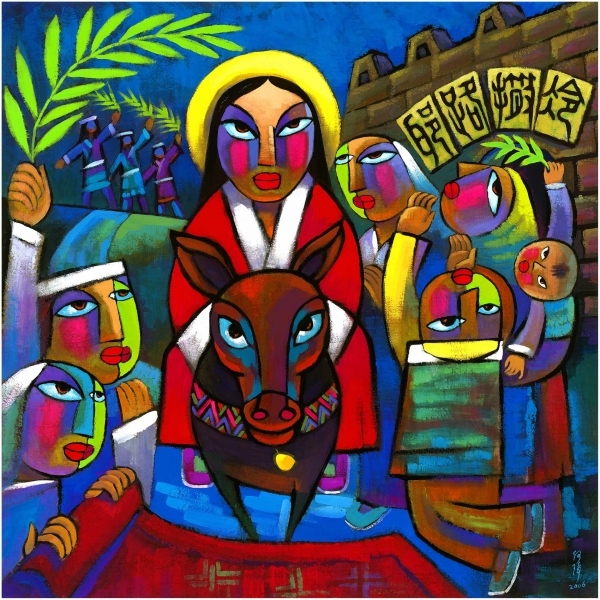 He is also a member of the China Art Association and a former council member of the Asian Christian Art Association (1998-2006). He received 20th Century Award for Achievement in recognition of outstanding achievements in the field of Religious Art Theory and Christian Art Creation of IBC in Cambridge, UK. His art works have been displayed in museums, galleries, universities and churches, in New York, San Francisco, Berkeley, Chicago, Los Angeles, Minneapolis, St.Paul, Birmingham, Pittsburgh, St.Louis, Hartford, Elizabethton, Richmond,Tokyo, Kyoto, Hong Kong, Nanjing, London, Oxford, Gevena, Aachen, St.Petersburg, etc. His art works have been introduced on numerous news paper and magazines, such as: Washington Post, Christianity Today, Far Eastern Economic Review, Hong Kong Cable TV, BBC-UK, ABC-Australia, Copenhagen Daily (Denmark), Bet Binnenhof Daily in the Netherlands, China “Fine Art”, Xinhua News Paper, Princeton Post, Minnesota Monthly, Saint Paul Pioneer Press, Star Tribune, WCCO TV, etc.He has been invited by universities and seminaries to be a visiting professor and artist-in-residence to do lectures and art exhibits such as: Yale Divinity School, Princeton Theological Seminary, New College and Regent’s Park College of Oxford (UK), Toronto University(Canada), Wheaton College (IL), Luther Seminary (MN), Theological Seminary in San Francisco (CA), St.Olaf College (MN), Drew University (NJ), Samford University (AL), Millgan College (TN), Nanjing University, Renmin University of China, Alliance Bible Seminary (Hong Kong), etc. To learn more about the artist and his work, visit the official website.